Al sinds de release van De Sims 4 ruim twee jaar geleden is er niet één feature dat zo erg gemist werd als peuters. Sinds De Sims 2 zit de levensfase tussen baby en kind immers standaard in de franchise. Juist dát moeten schrappen, is iets dat veel Simmers tot op de dag van vandaag eigenlijk nog steeds niet helemaal begrepen. Gelukkig is daar vandaag eindelijk verandering in gekomen; via een gratis update – de grootste update tot nu toe zelfs! – zijn peuters vanaf nu namelijk voor iedereen beschikbaar! Meer over de peuters kun je lezen in de bijbehorende Community blog of in de officiële FAQ op het Engelstalige forum. Wait you skipped right to the what’s ne… what the whaaat?! Toddlers? Toddler toddlers… toddlers? Um, did you just say toddlers? Perhaps. But the long standing ‘no talk’ of toddlers talk may be toddler blocking me. And, as such I can neither confirm nor deny their tiny toddler toddling presence in this release. I can however, say that any resemblance to a toddler in this toddler release is purely todd-idental… ler. For you and your toddler’s safety, please keep all toddlers at least 5 feet from all toddler messaging about toddlers. In case of fire do not break glass, but grab the nearest toddler and exit the building in an orderly fashion. Once safe, please take a moment to find the toddlers parents if the toddler was not yours. Also, for a toddler lasting more than 9 days, turn aging on. Batteries not included, so feed your toddler. Well whew! 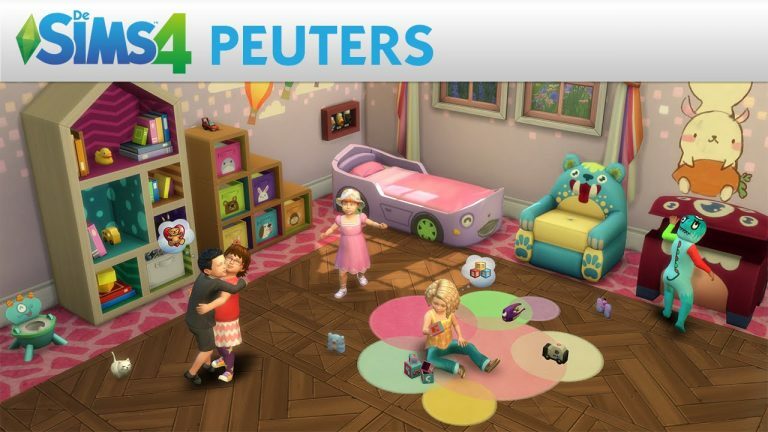 We’ve just had 24 toddlers already born in these release notes (make that 25). I feel there may be more toddlers on the way… so Woohoo*! *Woohoo will not directly produce a toddler, but provide for the groundwork for a future toddler. Argh! So… TELL ME ABOUT TODDLERS already!!! Let’s start with “How do you get a Toddler”? Add your toddler in Create a Sim! Sorry for the caps, but this is kind of important. Toddlers have a special relationship with caregivers. Mothers, brothers, fathers, sisters, or anyone you choose via the in game interaction Adopt as Caregiver (found under the toddlers Help… interaction menu) are caregivers. Being a Caregiver will ensure that the caregiver Sim cares for the toddler, while other Sims may be less inclined to answer the crying calls of your average toddler. Ok, now that the Caregiver bit is over with… let’s get into the other customization options. 8 new traits to pick from! Presets for the various toddler body and head parts to assist in your customization, as well as the same ability to modify the body and face parts that other Sims have. Does it make sense that that toddler wears an alien sized diaper? No, no it doesn’t. But, it’s really cute! Plenty of Styled Looks to choose from. Full body outfits, tops, bottoms, socks, leggings, and shoes. Glasses, hats, hairs (and hair colors), freckles, and teeth. Did we talk about the new teeth yet? Yes, teeth for all ages! Head in to Create a Sim, click on your Sims head, click the Face category, and then Teeth to customize your Sims smile. Choose the Household… Adopt option on the computer, to adopt your very own toddler! They come fully toddler-ized, ready for your snuggles. Or, if you want to do things the old fashioned way, age up your baby! It starts with… look it’s a birds and bees thing. There’s a flower, some pollen, and the bee… um, go ask your mom. Bathe, and Bubble Bathe them. Be aware of the possible splash back. With a Potty Chair they can Go Potty, and Ask for Potty Help… or just use their diaper. And of course, non-toddlers will have to Clean the Potty, and Change the Diaper. Sleep, Nap, Ask to be Read to Sleep or Tucked in, Sit and Chat all on a Toddler Bed. Toddlers prefer the high chair where they can Ask for Food or Drink, and of course Eat. But they may find their food more fun than edible. Be hugged, snuggled, talked or played with, or listened to. And as they do ‘things’ they learn skills like communication, movement, thinking, imagination, and potty. And their caregivers can be available to mentor and help them along. But they want to have fun to, right? Of course, and there are many ways for toddlers to have fun, or… not. They can cry, laugh, yell, and throw a tantrum. Or babble in the mirror, tell stories, talk about dinosaurs, princesses, superheroes, parties, art, the day, their favorite animals, or just Ask Why… over and over and over. Or play in things, find out what that is, splash in the toilet (hopefully you are a neat Sim), ask to be picked up, or talk to strangers (stranger danger). Maybe they want to watch toddler videos, play Simshape or Blicblock Baby, draw with llama on the Wabbit Tablet. Or build a tower, study shapes, or ask others to help them build and study with the Nesting Blocks. They can hit, hug, or talk to their giant stuffed animals. Read or ask to be read a toddler book. Look at flash cards, and learn animals, basic needs, letters, or objects. Play with the toybox toys, and the dollhouse. Dance and listen to music (including the new Lullaby and Kids radio station). No, toddlers do not die. They are fireproof. Yes, they can climb stairs, run and walk – but you’ll have to improve their movement skill. Stop that, I just wanted to know can toddlers do anything else? …be your little sister or brother, son or daughter. Try your patience. Be loving but a handful. They can take all your time, or be ignored. They can travel with you, or go to daycare. Or you can stay at home, and hire a nanny. They can provide special moments for you and your Sims. And they can grow and learn, as they age up into children, teens, young adults, adults, and eventually elders. They can’t die, but they can be taken away. And ultimately, they can be part of your Sims family, and your stories. 2 Curtains, 5 wall decals, a light for floors and a light for ceilings, a dresser, a rug, a wall shelf, an end table, a wall sculpture, a living chair, 4 decorated toddler doors, AND 7 walls and 2 floors. That sure is a lot. Did you address any issues? You can now use the Design Tool on a bassinet containing a baby, because sometimes your baby just doesn’t match your room. And you can’t change the baby. Put down the baby safe paint and brush, and just back away. Walls can now be built along all four edges of penthouse lots, rather than just three. We addressed an issue that could cause the game to freeze while playing the Doctor Career or when hiring a Nanny in some languages. *childish moment* Playing doctor, hehe. We addressed an issue that could cause doors to be stuck ajar. Abigail a toddler, Aidan a toddler, Alex a toddler, Alexander a toddler, Allison a toddler, Alyssa a toddler, Andrew a toddler, Anna a toddler, Anthony a toddler, Archer a hog of war, Ariana a venti-toddler, Ashley a toddler, Austin a toddler, Ava a toddler, Avery a toddler, Benjamin a toddler button, Brandon a toddler, Brayden a toddler, Brianna a toddler, Brian not a toddler because he turned aging off and stayed a baby, Caden a toddler, Caleb a toddler, Cameron a toddler, Chloe a toddler danced the tables, Christian a toddler, Christopher a toddler, Connor a toddler, Cruz a toddler, Daniel a toddler, David vs toddler-iath, Dylan a toddler, Elijah would a toddler?, Elizabeth a toddler, Ella a toddler, Emily a toddler, Emma a toddler, Ethan a toddler, Etta at last a toddler, Evan a toddler, Gabriel a toddler, Gavin a toddler, Grace a toddler, Hailey a toddler, Hannah a toddler and her sisters, Hunter a toddler, India a toddler, Isabella-watcha-doin-toddler, Isabelle a toddler, Jack o’toddler, Jackson a toddler, Jacob a climber, James a toddler, Jasmine a toddler, Jayden a toddler, John a toddler, Jonathan a toddler, Jordan a toddler, Joseph a toddler, Joshua a toddler, Julia a toddler, Kaitlyn a toddler, Katherine a toddler, Kayla a toddler, Kaylee a toddler, Kylie a toddler, Kyra a toddler, Lauren a toddler, Lily a toddler, Logan a toddler also known as James, Lucas a toddler, Luke – use the toddler, Mackenzie a toddler, Madeline a toddler made with flour, eggs, lemon, sugar, and vanilla, Madison a toddler and an avenue in a popular board game, Makayla a toddler, Mason a free-toddler, Matthew a toddler, Maya a toddler, Megan a toddler, Mia a toddler, Michael a toddler, Morgan a toddler, Natalie a toddler, Nathan an uncharted toddler, Nicolas a toddler, Noah a toddler on an ark, Olivia a toddler-newton-john, Owen a toddler, Plum a toddler, Rachel we miss you a toddler, Riley a toddler, Rosemary’s toddler, Ryan a toddler, Samantha b toddler, Samuel a toddler on snakes, Sarah a toddler, Savanna a plain toddler, Sean a toddler, Sophia a toddler, Sydney a toddler-mate, Taylor a toddler, Thomas a toddler, TK-421 a trooper, Toddler a toddler, Tyler a toddler, William a tell-toddler, Zachary a toddler, and Zoe a toddler. We look forward to your stories, and we wonder who your toddler will be? Check out our FAQ for additional Toddlers related questions. Het ziet er leuk uit! Ik heb er nog niet echt mee gespeeld (iets met een scriptie die af moet), maar alleen een baby laten opgroeien tot peuter. Het komt op me over alsof ze ietsjes ouder zijn dan in de Sims 3, klopt dat? Misschien heb ik dat helemaal fout, ben in elk geval heel benieuwd.